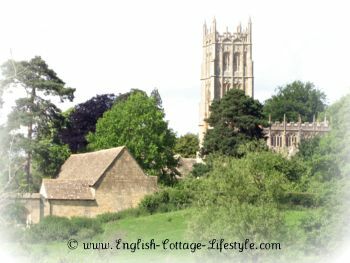 ECL's guide to The Cotswolds England. Discover the best attractions, local food and a guide to the most picturesque towns and villages. 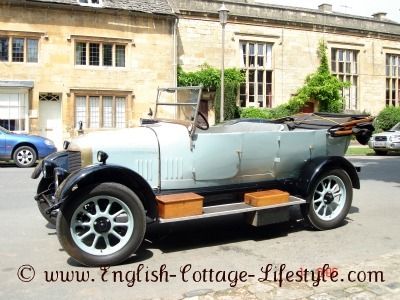 Cotswold villages are nestled in some of the most popular English countryside their wold’s; meaning ‘rolling hills,’ undulate and meander through six of England’s counties; Gloucestershire, Worcestershire, Warwickshire, Oxfordshire, Somerset and Wiltshire. The limestone here is prized because it is one of the finest building materials to work with and sits near the surface making it easier to quarry than other limestone. …’In Europe the best wool is English and in England the best wool is Cotswold’. That should give you an idea of the staggering wealth the wool trade bought to this area. 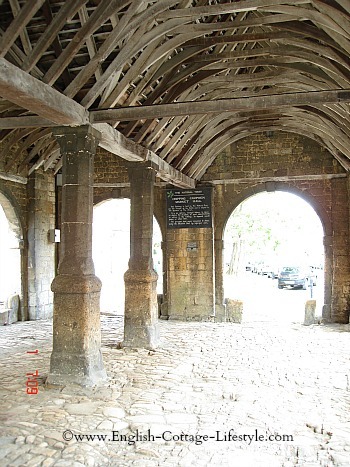 This wealth was transformed into new cottages, town houses, manors, villages and market halls all made from the local stone. Combined these buildings make the Cotswolds so unique and famous all around the world. 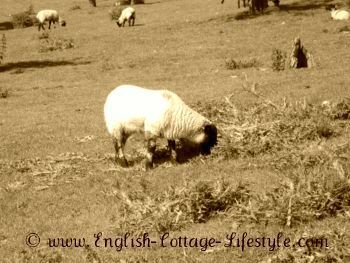 Photo: Sheep grazing in the 'wolds'. The word’ Cotswold’ comes from a 12th century Anglo Saxon chieftain named Cod who owned high land or ‘wold’ this became ‘Cods wold’ and eventually formed the name ‘Cotswolds’ you might also hear it being called ‘King Cods land’. It could also come from the word ‘Cot’ meaning containment, such as a sheep pen, and combined with the word ‘wold’ which, as mentioned, above means rolling hills. As the name suggests these ‘wold’s’ make lovely walking country, the hills are gentle and rolling and almost every few miles you can find another village or pub dotted along the paths and roads. Even the ‘River Windrush’ that runs through the beating heart of the Cotswolds has a name evocative of glorious summer days, which fits this serene landscape unspoilt by time. If you love stone cottages, glorious English countryside and old world charm combined with a foodie paradise then the Cotswolds could be your dream destination for a cottage holiday. 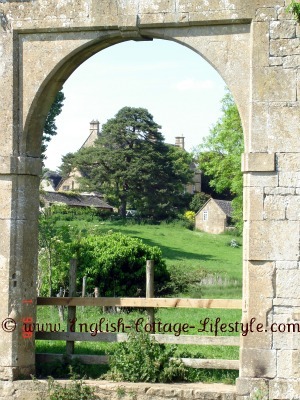 I grew up in the county of Worcestershire and spend many hours playing in the Cotswolds, it’s one of my favourite places on earth and it’s a ‘must see’ for the English cottage lover! Have a look at the selection from ‘Toprooms ' click on the link below. If you can try to stay in a cottage to really feel at home here, there are plenty to choose from just remember to book early to avoid disappointment. The summer season will be busy so if you are having no luck finding a cottage, consider travelling off season. This area is one of those special places where it’s stunning in winter as there will be plenty of old pubs with roaring fires to keep you warm while you look onto snow covered villages and wold’s. Spring in the 'wolds' is equally delightful with all the lambs playing in the fields and spring flowers in bloom around the villages. Autumn has its own charm with the changing of the leaves in the Westonbirt Arboretum. You can also take your furry friend with you on holiday. You both will have great walking on your door step…just be sure to book a pet friendly cottage. Great Comberton: One of the most attractive villages set in the lovely Vale of Evesham. Here you will find black and white thatched cottages. Bibury: William Morris called Bibury “the most beautiful village in England” look for the lovely row of cottages by the ancient Swan hotel, the River Coln is a celebrated spot for trout fishing so you can go fishing and cottage spotting if you fancy. Broadway: The beautiful Worcestershire village of Broadway is a must see for fans of the English Arts and Crafts movement. The beautiful 16th and 17th century stone cottages line the main street with ancient Inns. Chipping Campden: ‘Chipping’ is Old English for ‘market’ and you will see it a lot around the Cotswolds, if you are interested in the medieval wool trade this is where you should visit. This town also has some wonderful pubs, beer gardens, tea rooms and places to eat. TIP: Pop into the town bookshop for books by local authors on the area, the lady who I talked to was a wealth of information on the town and great fun! It’s and is also the setting for the annual Cotswolds Olympics if you’re feeling keen you can even enter the shin kicking contest! AONB: The Cotswolds are the largest of the 38 areas of outstanding natural beauty and one of the most beloved places in Britain. Once you’ve been here you will never forget it, gentle wold’s and a landscape unspoilt by time. 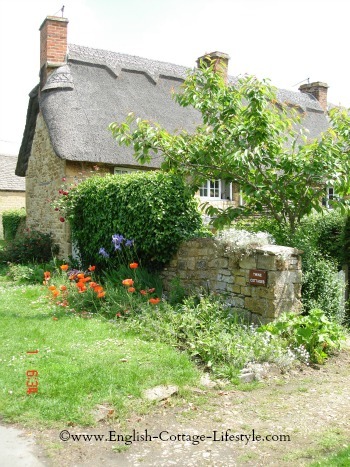 National trails: The Cotswolds way runs from Chipping Campden-(in Gloucestershire) to Bath (in Somerset)-for 102 miles along the escarpment, the trail has some lovely villages and historical sites along the way.